There is always something rather special about finding a cultivated plant from your garden growing as a wildflower in its natural state, and there are plenty of wild Common Snapdragons in the Mediterranean region. 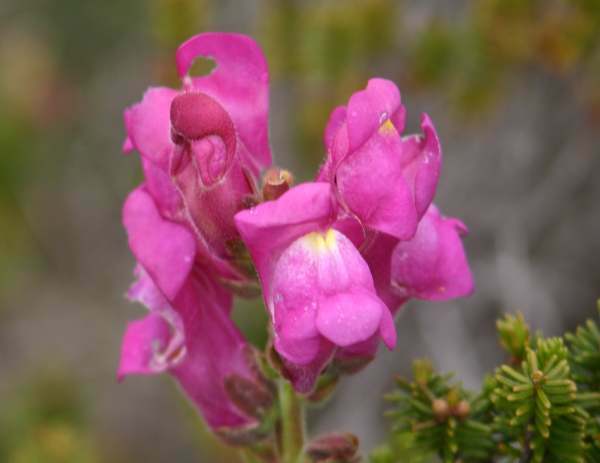 Finds of these flowers further north, including in Britain and Ireland, are most likely to be naturalised garden escapes, because the Snapdragon has been a popular cultivar for hundreds of years. A perennial plant growing to 1m or more, but more commonly 50cm tall, Common Snapdragon has lanceolate leaves typically 2 to 6 cm long arranged in spirals along the stems. Flowers, in elongated spikes, are each 3 to 4.5cm long with two lips that open when the sides of the flower are compressed - hence the dragon's mouth implication in the common name. Most wild plants have pinkish purple flowers with yellow-and-white areas where the two lips touch. Yellow snapdragons can also be found in the wild in Mediterranean countries, but they are most likely to be naturalised cultivars. Native to the Mediterranean region from Portugal in the west across to Turkey and Syria in the east, the range of this wildflower extends southwards into parts of North Africa and northwards as far as southern France. Elsewhere it is an introduced species that has escaped from parks and gardens to colonise old walls and dry wasteland particularly near towns and villages. March and April are the best months for seeing Common Snapdragons in the wild. 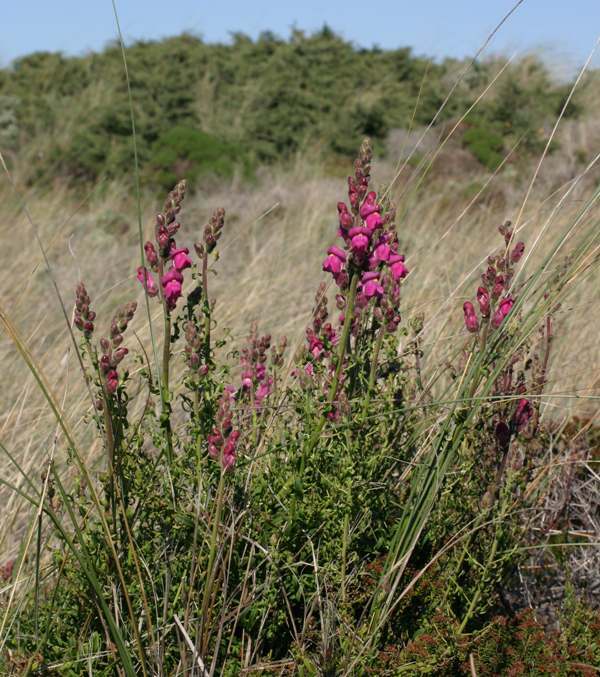 Coastal sand-dune systems and other areas of dryish sandy soil are favoursed by this Mediterranean wildflower, which also occasionally colonises the crumbling walls of derelict buildings. Garden cultivars in northern Europe also cope well with dry, sunlit locations, where they bloom rather later and are often at their best in June, July and August. Snapdragons are pollinated by bumblebees, which crawl inside the lips so that the mouth of the dragon closes over them; they emerge covered in pollen which they transport to other flowers that they visit. Less conspicuous and spectacular, a smaller relative the Lesser Snapdragon Misopates orontium is a weed known in many parts of the world. 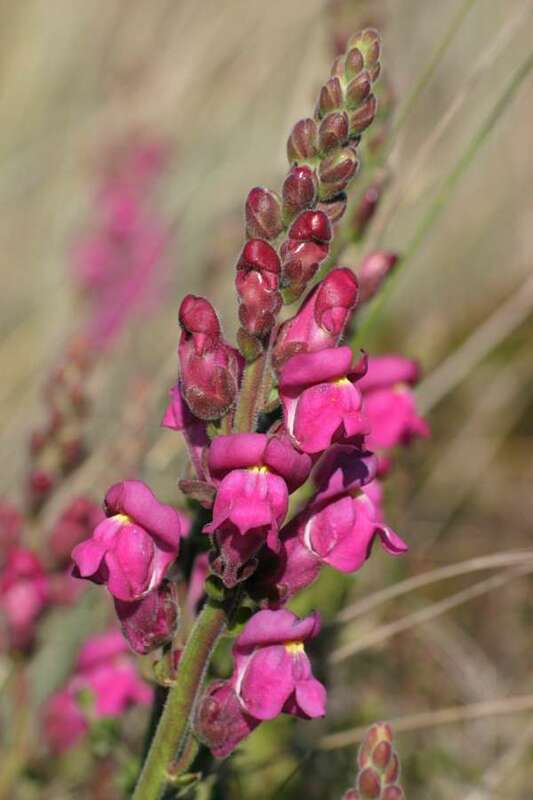 The Snapdragon used to be a member of the Figwort family (Scrophulariaceae), but following recent changes of taxonomy it is now in the family Plantaginaceae with the various plantains (Plantago species) and many other fomer 'scrophs' . This specimen was photographed in the Algarve in Portugal near Cape St. Vincent in May - one of Europe's very best places for a huge variety of wildflowers.